The Belize Barrier Reef Reserve System lies off the eastern coast of Belize. It is the longest barrier reef in the Western Hemisphere and the second longest in the world. Most dives are drift dives and led by certified dive masters from Belize Underwater. Snorkelers and divers go out on the same boat. Snorkeling, PADI courses, and Discover SCUBA include equipment. Equipment may be rented for all other divers. Lunch is included on all full day excursions. The second largest barrier reef system in the world, the Belize Barrier Reef, is a sight to behold. Snorkel among delicate sea fans, colorful tropical fish, and impressive corals. This Belize Barrier Reef Snorkel excursion includes two separate snorkels with experienced guides who make sure you are comfortable in the water. Then you will be led to the reef, where you’ll experience all the critters of the Caribbean sea. The Belize Barrier Reef, the largest barrier reef in the western hemisphere, is a world-class dive destination that should be to the top of every diver’s bucket list. A trip to the Belize Barrier Reef is suitable for both novice and experienced divers, with dive sites ranging from 35-65 feet deep. 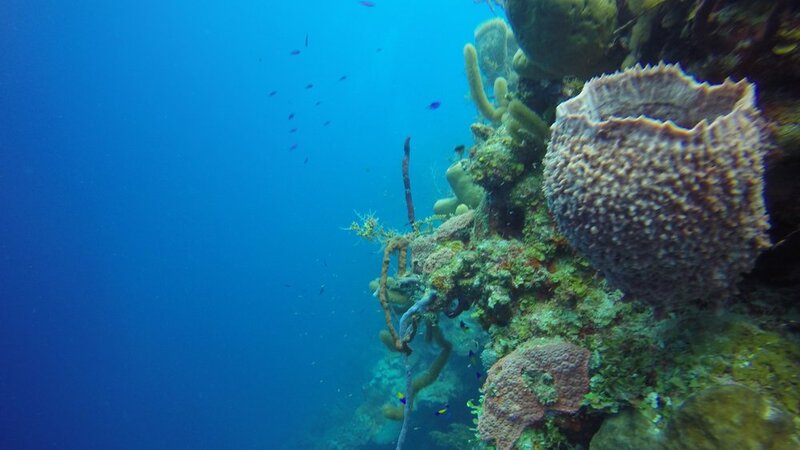 Each dive is a drift dive where you can relax and enjoy the mild current as you dive along multicolored walls and steep ridges teeming with remarkable sea life. Turneffe Atoll is a three-tank dive excursion and despite a longer boat ride, the rewards are great. Drop in to the crystal clear Caribbean Sea and drift along the wall slowly with the current. Atop the coral crusted wall, look for thumb nail sized spotted drum fish pirouetting in protected crevices like ballerinas, and curious Moray eels prowling for lunch. Turn toward the abyss and watch for enormous groupers, passing sharks, tornado-like schools of jack, and rivers of creole wrasse. Swim over the edge to find spiny lobsters, tubular sponges, and enormous crabs. No matter the dive profile, divers will find colorful and cryptic creatures in every nook and cranny. Hop on the Belize Underwater boat to Lighthouse Reef. Well known as one of Jacques Cousteau’s top dive destinations, Great Blue Hole National Park is a sight to behold for snorkels and divers alike. The Great Blue Hole is a very deep dive that reaches the limits of recreational SCUBA diving, and is suitable for intermediate and advanced divers with at least 25 logged dives. For Open Water certified divers eager to explore the blue hole, Belize Underwater offers the Deep Dive educational course that counts towards an Advanced Diver certification. Snorkeling the Great Blue Hole is an equally exhilarating experience for non-divers, or divers that don’t meet the deep dive qualifications. After exploring the Great Blue Hole, you visit two additional sites in the Half Moon Caye National Monument to complete this great diving and snorkeling adventure. 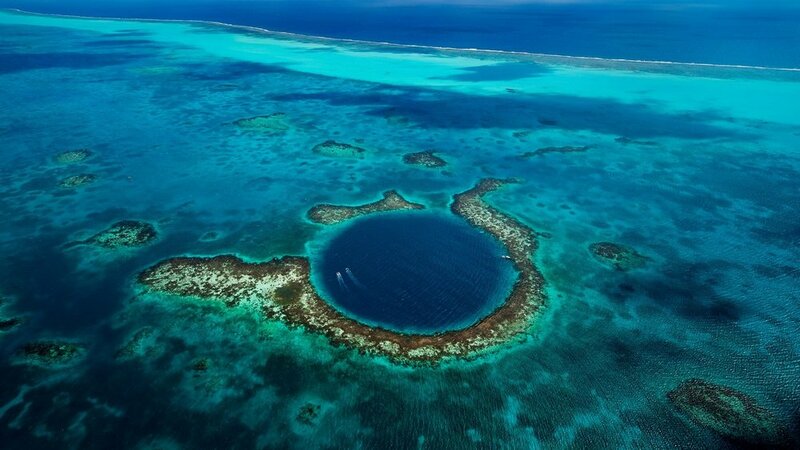 *For safety purposes, all divers joining Belize Underwater for a SCUBA dive at the Blue Hole must schedule a “check out dive” prior to the tour date. Glover’s Reef Atoll is a three-tank dive excursion well-worth the longer boat ride. Spectacular coral gardens, abundant megafauna, and the most dramatic wall diving can be found at Glover’s Reef Atoll. Designated as a Marine Reserve and UN World Heritage Site, Glover’s Reef offers unforgettable diving for both novice and experienced divers. Unlike other dive sites in Belize, visitors are treated to a feeling of unparalleled remoteness and are often the only divers at the site. Drop in to the crystal clear Caribbean Sea and drift along the wall slowly with the current. Atop the coral crusted wall, look for thumb nail sized spotted drum fish pirouetting in protected crevices like ballerinas, and curious Moray eels prowling for lunch. Turn toward the abyss and watch for enormous groupers, passing sharks, tornado-like schools of jack, and rivers of creole wrasse. Swim over the edge to find spiny lobsters, tubular sponges, and enormous crabs. No matter the dive profile, divers will find colorful and cryptic creatures in every nook and cranny. Prior to your vacation, complete the knowledge development and pool sessions at your local dive shop. Once you’re in Belize, we’ll spend two days finishing your open water dives. Leave Belize with your PADI certification and a few completed dives along the largest living barrier reef in the world. While not a scuba certification course, the Discover Scuba program will allow you to safely dive in shallow water with an instructor for the duration of your time with Belize Underwater. This introductory dive lesson takes approximately two hours with a certified PADI scuba instructor. Once comfortable in the water, you and your instructor will explore the reef together, diving to a maximum depth of 40 feet. 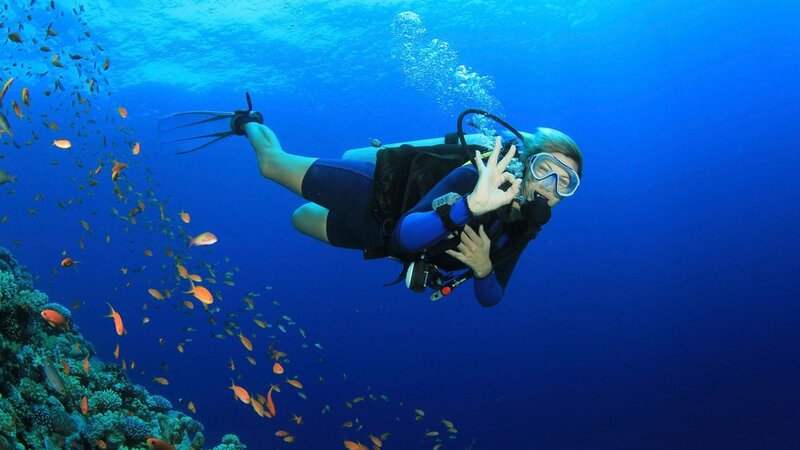 The Discover Scuba program is perfect for people who would like to try diving before committing to a full certification course, or for those wanting to try diving but are on a tight schedule.